The Pentagon’s budget, released in February, envisioned the reduction to 450,000 would occur by Sept. 30, 2018. Some of the cuts were expected. During the peak of fighting in Iraq and Afghanistan, the Army swelled to about 570,000 soldiers to ensure that deployments could be limited to one year. After most troops came home from those wars, the Army planned to shrink. The Army should bottom out at 450,000 soldiers, said Michael O’Hanlon, a military analyst at the Brookings Institution. Cutting “more would make me quite nervous,” he said. The Army declined to comment on the proposed reductions in its forces. If the automatic budget cuts known as sequestration, set to begin in October, take place the Army would have to slash another 30,000 soldiers, according to the document. At that level, the Army would not be able to meet its current deployments and respond to demands for troops in other regions. Among the proposed changes, brigades at Fort Benning, Ga., and Joint Base Elmendorf-Richardson in Alaska will be downsized from units of about 4,000 soldiers to battalion task forces of 1,050 soldiers. Downsizing Army forces in Alaska “makes no strategic sense,” said Sen. Dan Sullivan, a Republican member of the Armed Services committee from Alaska. The White House emphasis on shifting military assets to the Asia-Pacific region and concerns about Russian aggression in the Arctic require strong forces in Alaska. The Army overall will require more than 450,000 soldiers because the number of national security challenges around the world have “risen dramatically” in the past few years. 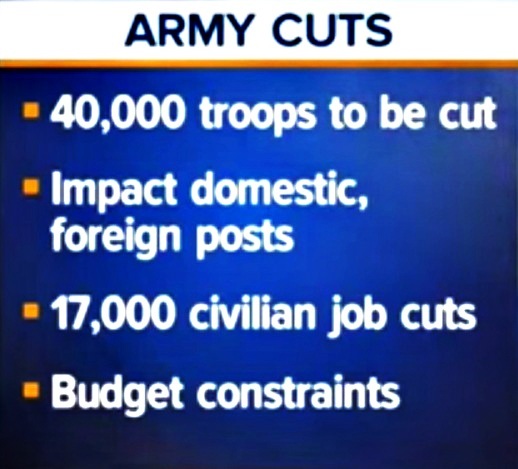 In 2013, the Army maintained in budget documents that dipping below 450,000 soldiers could prevent it from prevailing in a war.